You’re planning to go camping next weekend and you just remembered that on last year's camping trip you noticed a small tear in your tent. If not repaired, that small tear can quickly become a larger problem. However it really is easy to repair, even on the trail). So remember to always take your mending kit with you when tent camping. (see "tent flooring" below for details) "kiddy blow-up swimming-pool’ repair patches and adhesive. 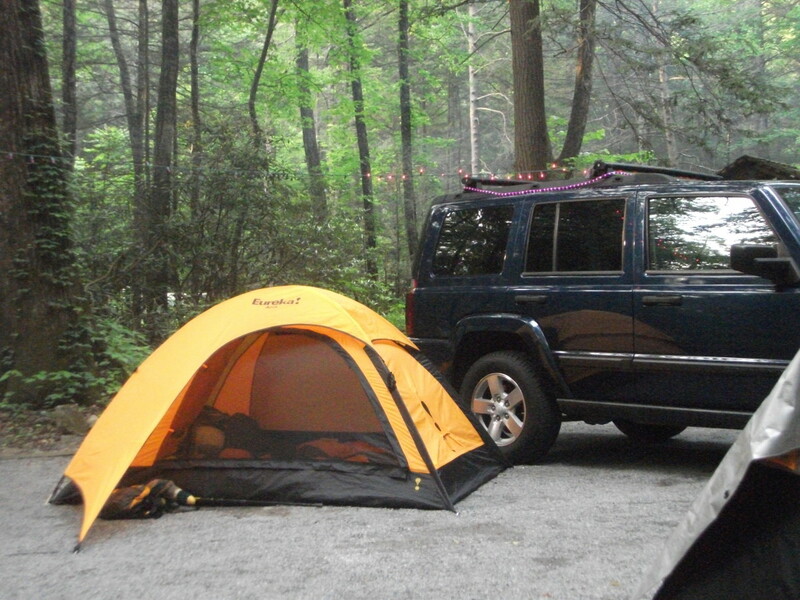 To mend tent flooring: Most tent floorings are made of fiber- or fabric-reinforced ‘tarping." To mend the tent floor and make it watertight again, you don't sew it; you need patches and adhesive made for kids' inflatable pools. Add patches from inside and outside, following the manufacturer's instructions. Duct tape over the whole patch outside will give added protection. Even though the patch kits say sealing is enough to repair a rip, I prefer to sew all the tears then cover them with the appropriate patch and sealer inside and out. My old canvas tent has had a patch for over twenty years and is still in use. Our newer nylon two-room tent has two patches. One large one is near the front flap where it got zippered in accidentally; this one had to be fixed at the camp site fast, as there was danger of us being carried away by the bloodthirsty jeep-sized mosquitoes. The following method has served me well. Large tears must be sewn closed before being patched with a patch or repair tape because the tension on the fabric could eventually pull the rip apart again. You can do the on-site fixit job then add a larger permanent patch once you’re home, using the sewing machine. Give the patch a double topstitching all around, then remember to run a sealer bead over the seams to make it water-resistant again. Reseal occasionally, once every year or two. Cut two patches, one that is at least 1½ inches wider & longer and one that is 2 inches (5 cm) wider & longer than the tear. Pin the smaller patch on the inside of the tent. With your thread and needle using small back stitches sew the patch on securely. Working from the outside, gently lift the tent fabric at the tear and squeeze in a small amount of the sealer/adhesive all around the tear. Flip tent around so that you can work on the outside. Cover the larger patch with sealer/adhesive and center it over the tear from the outside hand press firmly in place. Wait ½ to 1 hour at least, then run a bead of sealer around patch. Check product description for the full curing time, usually about 1½ hours, then spread a bead of adhesive around the patch on the inside of the tent. It is important to wait at least the full curing time, but 24 hours is best before packing the tent away. If the circumference bead is not totally, totally dry, it can adhere to unwanted parts of the folded-up tent during transportation. Cut a patch of nylon screening at least 2 inches (5 cm) wider and longer then the tear. Center the patch and gently pin it into place, working on the outside. Stitch the patch in place with small stitches, using the screening holes for easy work. Give it a triple stitching starting very close to the outside edge of the patch, and one tacking down as near to the tear as possible. 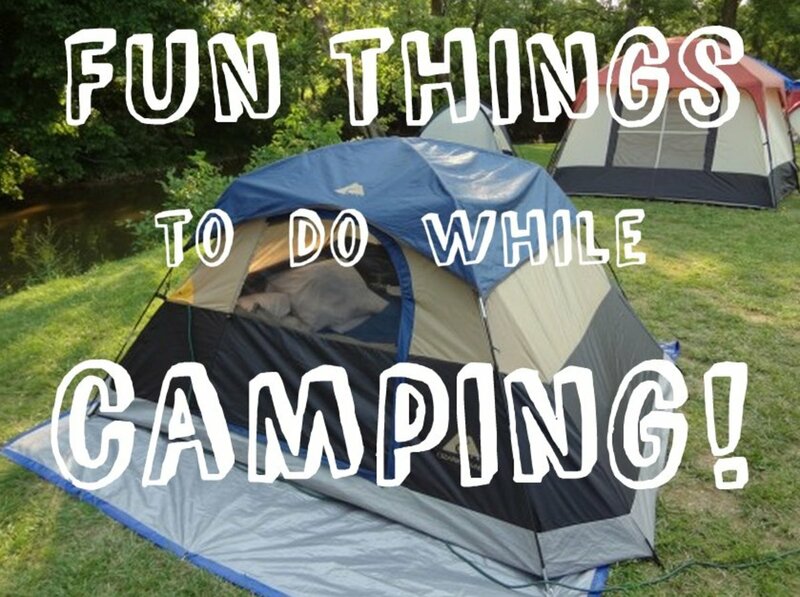 Happy tenting…see you at the campsite! Have you seen this product? www.fixmytear.com. I bought this repair tape a few yrs ago and am finding it really helpful in a lot of different surface repairs. Recently i went for camping and due to rough weather i got my tent sheet torn. Then one of my friend got me a Coghlan tent repair kit and i felt its quite handy in repair of tent. Enjoy Camping!! maxravi, thank you for taking a look and for commenting. nice hub. I will keep it bookmark.thanks..voted up! HerbalMama, thanks for taking a look and for commenting. Good luck with the fixings... if you follow step by step it will work out just right. Just what I needed to know! My dog ripped a huge hole in the screen of our backpacking tent two years ago and I have never fixed it 1) b/c I didn't know how and 2) the thought of how expensive it might be to repair by the company! Thanks so much! armysurplus365, I have a canvas tent that's been used every year for 27 years. If I remember right it has at least 8-9 patches and two new zippers. I also own a two room nylon tent that's only 12 years old, friends borrowed it and it came back with some major damage but I was able to fix it using the procedures written up in this hub. I hate to throw anything out that still has potential for use. Thanks for taking a look and for commenting, reversecharles. PR_am, thank you for taking a look and for commenting. Very useful hub. Thanks for sharing this knowledge. Hiya compu-smart, how are you? I've fixed quite a few tents in my sewing shop over the years. Any other hints please add them here. Thank you for taking a look and for commenting. Hey Zsuzsy Bee, i came by to offer you my tent repair tips but you have covered them all and then some! Kim thank you for taking a look and for commenting. very well written. well explained directions. Sabbatha thanks for taking a look and for commenting. Glad to know that the tips might come in handy. Hello thank you for giving us the great Tips. I really liked how you have your hub set up. With all my children as boys it comes in handy to know how to repair their tents. Thanks. gldwing, I'm not quite sure where the broken hole is located as I'm not familiar with the tent you own but if I understand your problem right you will have to reinforce the pole hole again...you might be able to do that by attaching a large metal washer that has the right sized hole for the pole. My old canvas tent has two such fixings. I glued a washer over the hole on each side of the canvas then using extra strong upholstery thread I sewed it too. Every so often I have to reinforce the washers by sewing them up again as the thread wears and tears. Hope that this will help. 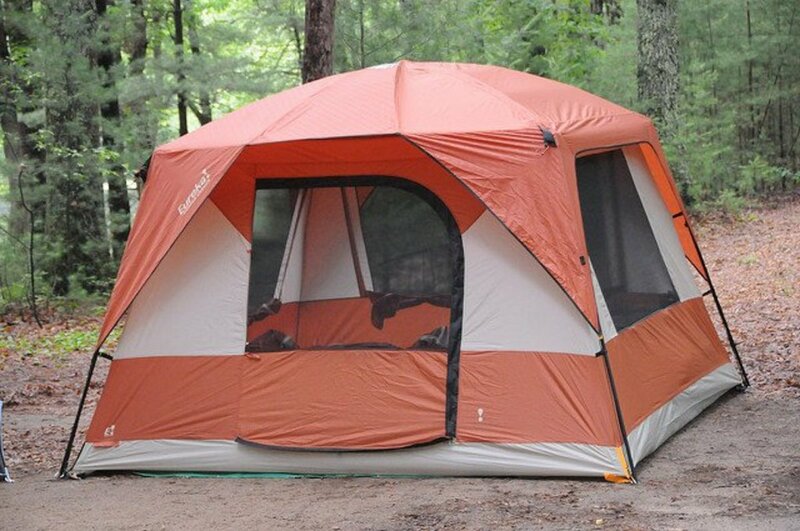 Hi- I am trying to replace or repair a center hub on my Stargazer 6 Eureka tent(discontinued model) it is an older style made of hard plastic and has 4 holes to accept the tapered end of the poles. One of the holes broke so it is unusable making the tent unusable??? Any Ideas??? MP, thanks for taking a look and for commenting. KItchen _Witch you're a hoot. '.....jacuzzi at the other end'. I love that. We're on the same page. When I go camping now, I like to rough it... there is a word for it, oh yeah its called 'RVing'. When the kids were young camping was the only holiday I could afford and I didn't have a problem with sleeping on the ground with rock pillows etc. Since the RV (2 years now) I spend a lot of time in it...sometimes just the dogs and I, at other times with the grandkids. I wouldn't want to parallel park that 38' long 'beheamus' though, but I think at my age that's the only way to camp now. Great Stuff! Clear instructions wonderful. Camping Dan! That is what I learned too, the hard way when we used to tent camp. Be preparred for it all. Nice hub! I always keep a tent repair kit in the stuff sack so that I am always ready to patch a hole. It never fails for me I get that hole in the first day out of a several day trip. This way I can fix it there and not have to worry about potential leaks or problems. mdawson! Thanks for taking a look and for commenting. Great insight and the information in this hub was very well needed. Sukkran! How are you? It's been a while. Always glad when you come for a visit. With the way the economy is right at the moment I think camping is going to have a revival this season. 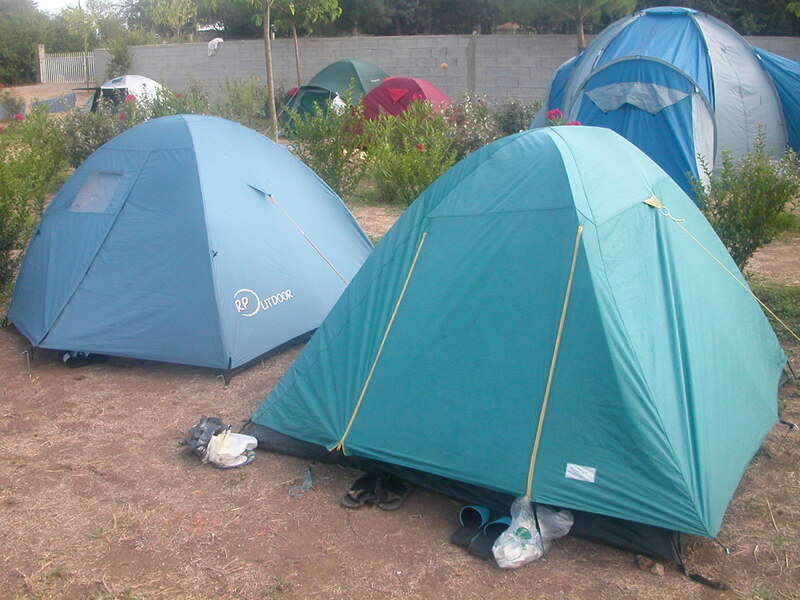 Everybody will dig out their old tents when it comes to vacation time and then they will need to fix their tents and spruce them up. This hub on tent repair might hopefully help some. wonderful page construction. really very attractive and the content is also useful. great work. Rochelle always glad when you pop in for a visit. If my know-how is useful to those that need it in the tent cities then they're more then welcome to it.I repaired quite a few tents at my sewing shop over the years by this method. I hope this hub will be helpful. Wow, Zsuzsy, do you know how valuable this knowledge would be in the rapidly expanding tent cities that are developing on the edges of towns? You could make a fortune selling your advice, skills and services to the people who are homeless, out of work . . and . . .broke. . .
Well, at least you could earn their appreciation. RKHenry! My nephew asked about how to fix his tent so I simply 'hubbed' my answer. Thanks for coming to take a look and for commenting. How did you know I was thinking about going camping this summer? lol!